At the start of 2017, I wanted one day where I could avoid thinking about all that I needed to do—find a new apartment in Shenzhen, move to Shenzhen, get all the paperwork I need from my last job, fill and collect all the paperwork for my new job, getting ready for my trip to Harbin, planning a vacation for the Spring Festival, writing term papers. There’s a lot that needs to be done, but I needed one day just to do something fun. As a result Jun and I decided to go to Huadu district in northern Guangzhou and visit a Taoist temple there that I had read about a few months back. It’s an easy trip to get there, but it’s a long trip. Once we got there we decided to have lunch at one of the restaurants nearby. It was a wonderful lunch and we were ready to visit the temple. The temple’s name is Yuen Yuen and it is the central Taoist temple in Guangdong province. It’s a relatively new temple, having only been built in 1998. It’s built on the principles of feng shui and the layout of the complex does create a harmonious environment. 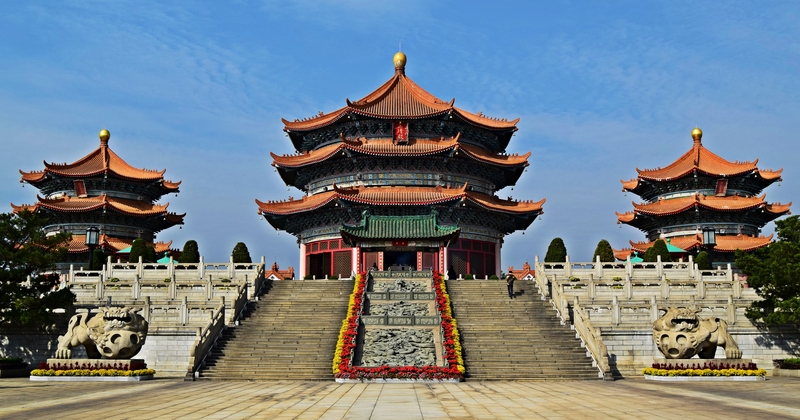 Some of the buildings resemble more famous examples of other Chinese buildings, such as how Sangquing Hall in the center of the complex imitates the Temple of Heaven in Beijing. When walking into the temple you start to see how well maintained it is. The gardens are gorgeous, and you can actually see where they work and grow the plants that make up the complex’s gardens. The first thing you see is Sangquing Hall. It takes center stage, but once you walk behind it you realize that the complex is much bigger than first expected. Behind this first area you walk to a number of halls where people may pray and leave offerings. From there you are able to go and view the central platform dominated by a statue of Lao Zhi, the founder of Taoism. It’s an amazing site to see in person. From there you can see a large hall that is inaccessible to the public but has a commanding position behind the statue. As we wandered around the temple complex, I felt more relax and at peace. Jun and I were quite content with our time there. I left feeling recharged and ready for this new year.